My son was in 1st grade when he came home from school full of excitement. “MOM! Today I learned how to dream with my eyes open!! !” To William, the ability to dream anytime/anywhere was the educational highlight of his short life. He started middle school two weeks ago and so far – he’s still daydreaming and growing in his imagination. Thus inspired (and renewed by 11 straight hours of sleep) the tweet encouraged me put fingers to keyboard for a quick, rainy day blog post. St. Ignatius believed in the power of daydreaming. He used words like imagination, reflection and contemplation. 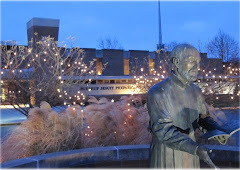 In his development of The Spiritual Exercises, St. Ignatius challenges the retreatant to imagine “the labors of the journey to Bethlehem, the struggles of finding a shelter, the poverty, the thirst, the hunger, the cold, the insults that meet the arrival of God-with-us.” (a great post on this topic can be found at IgnatianSpirituality.com here). He knew that daydreaming gave us time to change, grow and identify our desires. More modern educational theorists such as Dewey, Piaget, Egan and Montessori write on cognitive and social growth in imaginative play/study/work. Our imagination is where learning turns into understanding. For me as a Jesuit educator, reflection is where I take all my experiences of the day, allowing them to swirl around my understanding of the world and either fall into place or be discarded. My daydreams are where I stop inputting new information and begin to play, reflect, mix and match the sounds, images, feelings and actions of the day. It’s where the pieces fall together. So why do we criticize students for daydreaming? Why do we block windows so students will focus on learning? Why do we cram our teaching with words and more words? Why must every moment of the school day be scheduled and planned? Over 20 years ago, Brebeuf Jesuit took the still radical approach of creating Personal Responsibility Time (PRTs) into the school day. These are 15-40 minute blocks of time for students to take responsibility for their learning. Some study, some meet with teachers, some play intramural sports, meet as a club or throw a Frisbee around... some sit and stare out the window. And officially, the earth still spins on its axis. Students can and should have moments all their own during the school day. As the new school year begins, I challenge us all to offer times for daydreaming to our students. And while you are at it, find a little time for yourself to take a breath and let your mind wander. Albert Einstein is quoted as saying, “Imagination is more important than knowledge. For knowledge is limited to all we now know and understand, while imagination embraces the entire world, and all there ever will be to know and understand.” Words to dream by.